WASHINGTON – Public service announcements on poverty and on marriage developed by the U.S. bishops rank high in the number of times the spots have aired. In an era when television stations have cut back on the number of PSAs they air in favor of paid advertisements, in-house program promotional ads and infomercials, the poverty and marriage spots have been given the equivalent of more than $35 million in free airtime, according to an Oct. 9 news release from the U.S. Conference of Catholic Bishops. The Catholic Campaign for Human Development’s “Poverty Line” PSA – aimed at raising awareness of how many people live below the poverty line – ranked in the top 10 percent of the 852 PSAs that received at least one airing in 2007. Since CCHD’s “Poverty USA” spots began airing in 2001, the different ads have received 223,324 airings, according to Nielsen Media Research. The worth of the donated airtime amounts to more than $32.1 million. Nielsen, best known for rating TV programs, also tracks commercial airings through Sigma, a system that uses encoding technologies to track video airplay on TV stations throughout the United States. The “For Your Marriage” PSAs, which first started airing in 2007, have racked up 27,726 airings through Sept. 7, according to Nielsen. That puts the campaign in the top 20 percent of all PSAs used. The total donated airtime is estimated at $3.7 million. The amounts of donated time for both campaigns are based on a formula created by the Television Bureau of Advertising. A new set of “For Your Marriage” PSAs is scheduled to be distributed to U.S. TV stations in November. The spots are part of a multiyear national pastoral initiative on marriage developed by the U.S. bishops. The “For Your Marriage” campaign” is supported by a grant from the U.S. bishops’ Catholic Communication Campaign, which supports church media efforts. 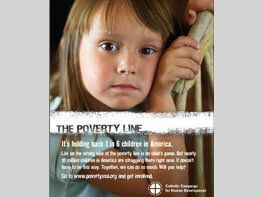 Editor’s Note: The poverty PSAs can be viewed online at www.usccb.org/cchd/povertyusa/multi2.shtml and the marriage campaign is available online at www.foryourmarriage.org.